Computerized dentistry has gotten more popular since Nobel Biocare® pioneered “all-on-4” teeth replacements several years ago. The original all-on-4 procedure was a manual method that didn’t utilize CT scans. Today, CT scans allow Dr. Nazarian, our dental implant dentist, to provide a more accurate treatment plan. Before all-on-4 implants became the trend, removable prosthetics like dentures were the most common replacement for missing teeth. Soon after, though, dental professionals from nearly all general and specialty areas adopted the all-on-4 treatment option. More technological advancements happened quickly. Cone beam x-ray equipment and specialized treatment software allowed dentists to provide higher levels of care. 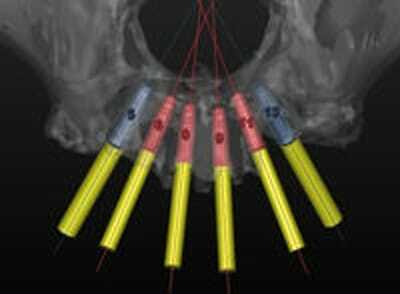 Among the advancements was the ability to use traditional crowns and bridges attached to a virtually-designed implant anchoring system. 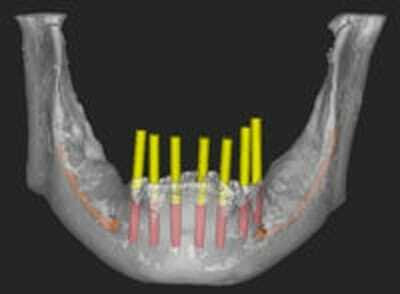 This new approach to implants provided much more accuracy than the older methods allowed for. 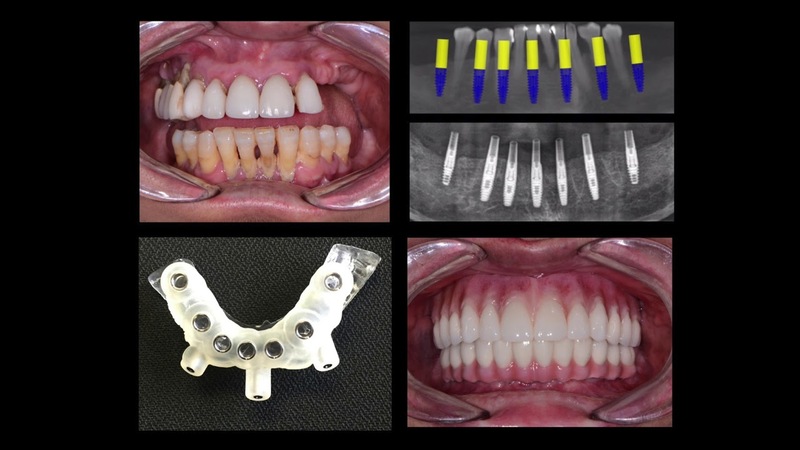 With computerized all-on-4 dental implants, we design a patient’s entire treatment plan before their procedure begins. Our CT scanning software can detect soft tissue conditions and bone quantity issues, as well as help us determine the type and placement of the patient’s future dental implants. This eliminates any “surprises” that might otherwise pop up during treatment. 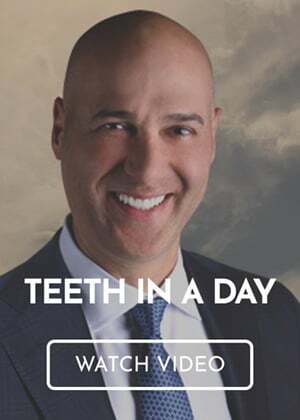 Thanks to advancements in dental technology, a small group of reconstructive dentists nationwide, including Dr. Nazarian, can now provide full-mouth or single-arch reconstruction in just one appointment. We can diagnose and treat a wide range of treatment needs, eliminating the need for specialist referrals. No matter what treatment our patients needs, they’ll leave our office the same day with a full set of new teeth. We’ll still schedule follow-up visits as needed for follow-up and placement of final restorations. This particular patient had a significant history of gum tissue loss and bone loss that destroyed their bite. Uneven tooth wear further caused discomfort and a loss of function. While gaping holes of bone loss did exist along certain areas of the upper and lower jaw bones, other areas had plenty of healthy bone to work with. Our specialized CT scan software assesses bone quantity and quality in 3 dimensions, so locating the best areas for implant placement no longer depends on guesswork. A custom selection of dental implants allowed Dr. Nazarian to create a solid foundation of six implants for the patient’s upper jaw that would overcome the differences in bone height and density. A CT scan of the lower jaw revealed not only the obvious bone loss, but also the areas of the bony ridge that had an ideal density of healthy bone. 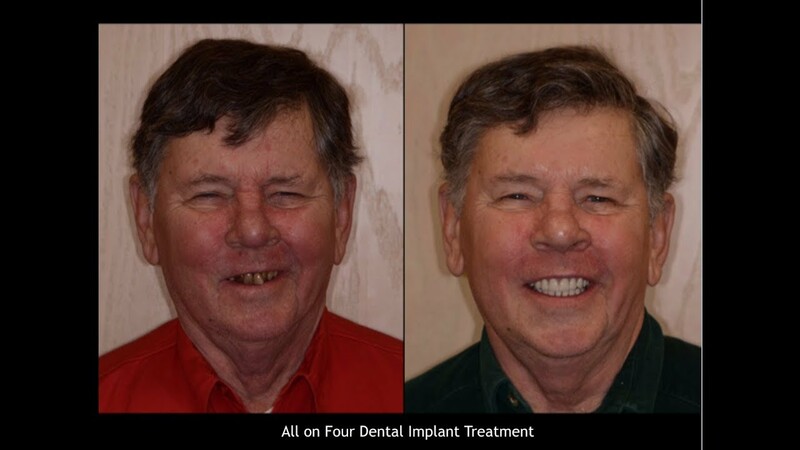 For this patient, we recommended a series of seven dental implants of different sizes to provide a solid anchor and stimulate the jawbone to prevent future bone loss. Our dental implant dentist will trim excess bone height as needed during dental implant surgery to assure that the bone level across the treatment plane is even, further ensuring the success of the overall treatment. We used the virtual treatment planning session to make an upper jaw surgery guide that created an ideal occlusal plane with the lower jaw. 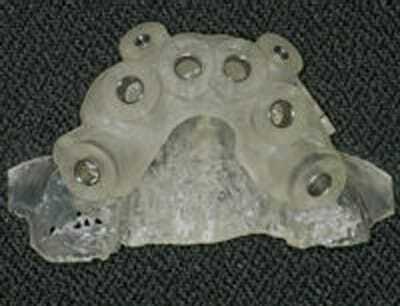 A special design of the lower jaw crown and bridge, incorporating a cantilevered placement of “new teeth,” successfully addressed an area of bone loss that normally would not accommodate natural teeth. Pictured here is the surgical guide that will ensure an accurate implant placement that matches up with the data generated by our treatment planning software. 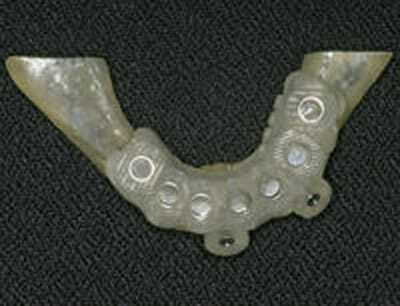 The guide is designed to fit snugly against the bony ridge of the upper jaw. Temporary anchor pins are used to prevent movement of the guide during preparation of each implant site. At the end of the treatment appointment, we provide our patients with temporary versions of their future replacement teeth. 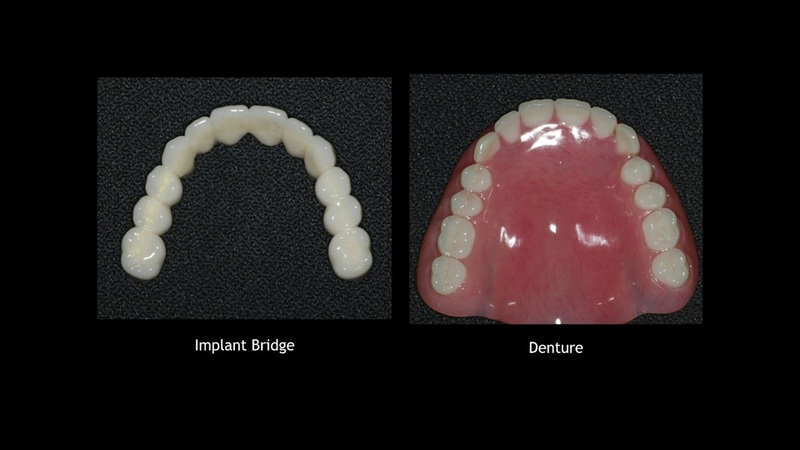 The use of temporaries enables the patient and Dr. Nazarian to make final adjustments in sizing, color, and natural fit before the final, porcelain versions are made. 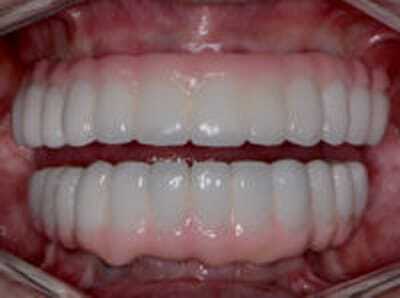 The final treatment photo pictured here demonstrates the degree of perfection a patient can achieve with Dr. Nazarian. The overall cosmetics are essentially perfect, and the patient now has a comfortable bite that will not deteriorate over time. Contact us directly to learn more about our all-on-4 one-appointment dentistry procedure. We’re always happy to answer questions about the process or about anything you see on our website. Our Troy, MI dental implant dentist offers all-on-4 dental implants to help you get your smile back. 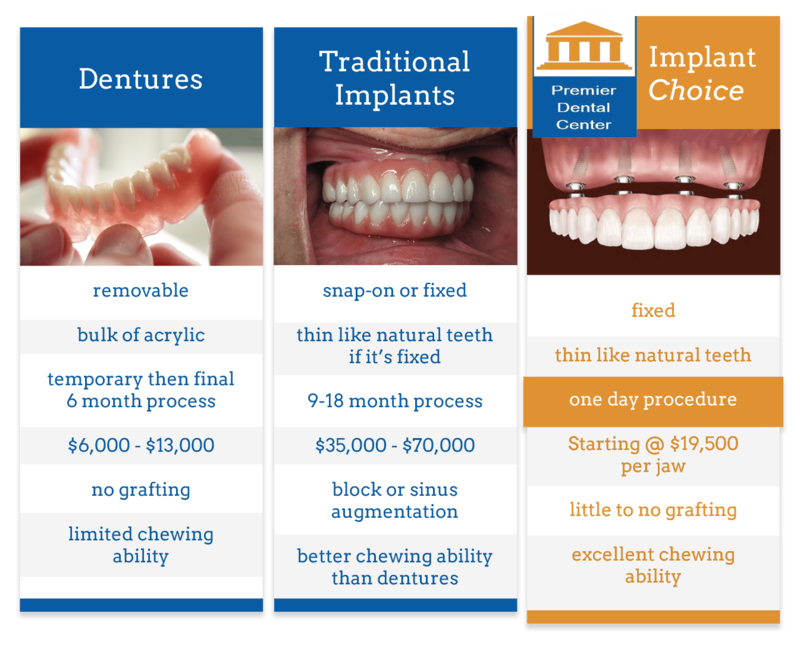 To request an appointment with our dental implant dentist, call Premier Dental Center at (248) 457-0500.